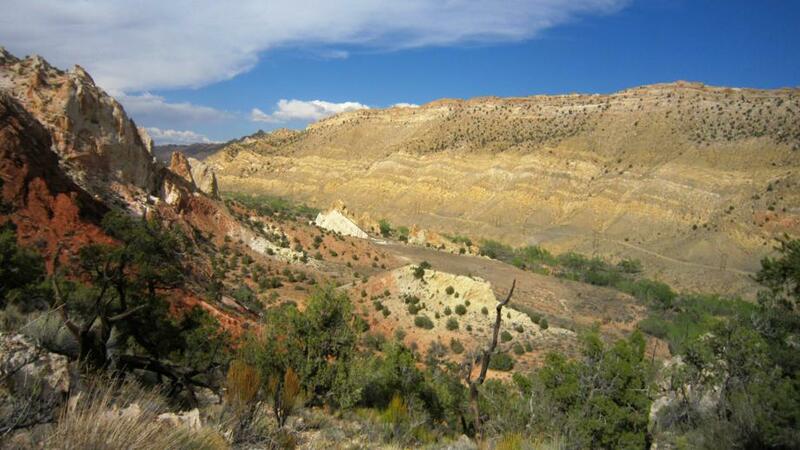 Bryce to Little Death Hollow: Pt 1 – Across Utah! Day-by-day report of my Bryce to Little Death Hollow Hike (aka the hike formerly known as Bryce to Moab.) I updated this page with short reports via my Satellite phone while on the trail. Since back, I’ve added additional detail and pics. See my daily positions on the Hike Map. Doing final packing and prepping in SLC. Getting ready to hit the road to southern Utah where I will grab a motel so that I can set out one final cache tomorrow and get my permits before hitting the trail in Bryce early afternoon. Got a late start due to all the prepping, but that was kinda the plan. 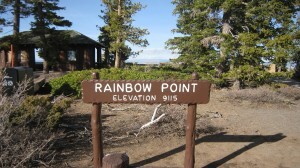 Descended from Rainbow Point thru strong gusts of wind and patches of snow. The sun going down on the orange spires of Bryce illuminated the entire landscape in an orange glow. I passed Birch Creek which ran clear. The next two streams were orange however. The official park camp at Iron Spring was empty. A “Beware of Bears” sign adorned the site marker. I checked out Iron Spring itself — it looked pretty nasty. 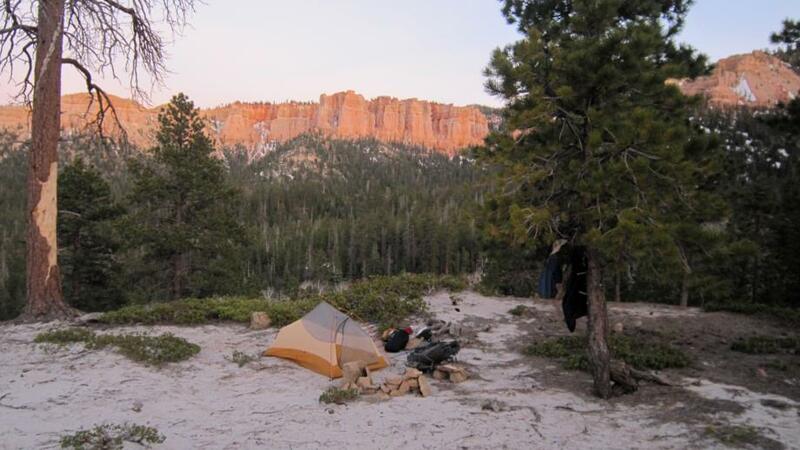 Once past the spring I follow the ridge east off trail and camped just outside the park with a great view. Chili Mac for dinner. Ready for a cold night. Pretty sun up on Bryce. And boy was I glad when it came up because it was a COLD night. Since I packed my “summer bag”, it actually felt colder than any night last year in the Sierras. I made my way down the ridge which separates Black Birch Canyon from Ponderosa Canyon. It might have been slower than walking the valley floor, but the views were great. Finally I desceneded into Black Birch Canyon, followed the wash a ways and then picked up a dirt road that went along Willis Creek. At one point I had to jump a fence to contine as the road crossed farmland. A group of horses spotted me and trotted right at me. Soon I was surrounded by 30 of them wanting food I presume. It was somewhat unnerving as they all crowded in around me. I could feel their warm breath on me. But, they were nice. From here I kept walking the road which parallels Willis Creek. I was surprised to see a rather new cabin/B&B farther down the road. They had blocked the stream to make two large ponds. As the road crosses a plateau there were great views to the north into Averett Canyon and far out to Powell Point. Soon my road intersects “Skut” road which I followed around the bend to the Willis Creek Trailhead. Bypassed the first small set of narrows and then entered the canyon. I saw 3 groups of dayhikers here. The slot is cool, with its dark brown and yellow colors. I was surprised to see the creek actually dry up in the second set of narrows. 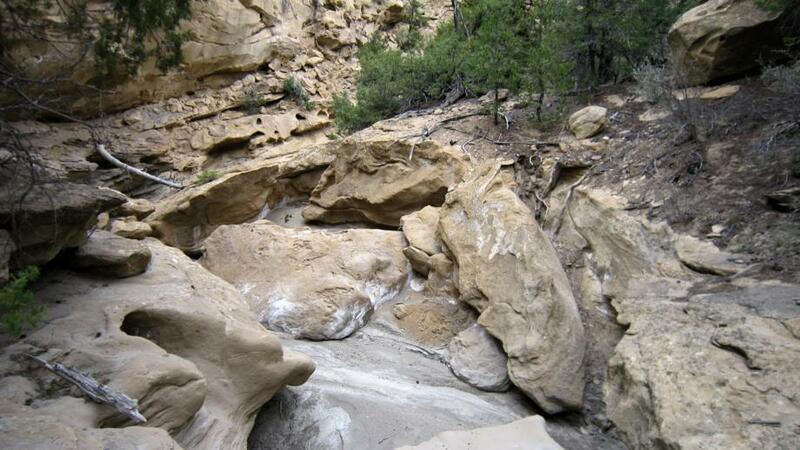 I continued on down to the yellow cliffs of Sheep Creek — also completely dry (until the very bottom.) I hiked till 8:30 to stay on goal and to the Paria. Found a cool place to camp right on the slickrock penisula at the junction. The frogs at night were going crazy. Got up and headed down the Paria which was flowing nice and clear. I found and explored lower Asay Slot. After getting past the brushy entrance, it was a nicely sculpted, but short canyon. I decided not to do the bypass and explore the upper end as I wanted to get a move on down the Paria. Later passed Lone Rock and checked out the old cowboy inscriptions. 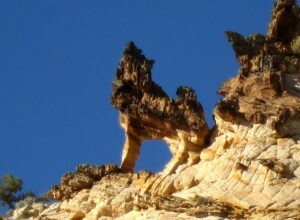 Took pictures of the arch nearby and was surprise to find another (very small) arch on the west wall as well. South of this point I checked every little nook and cranny for the famed “crack spring” and the “best water in the Paria” according to Kelsey. I thought I’d found it and was very dissapointed because the pipe was gone which rendered the small flow of water very dirty. However, a little farther down I found the correct spot and was pleased to find indeed some very good water straight out of a pipe stuck in the wall! There were a bunch of cowboy inscriptions here as well dating back over 100 years! I really like the Upper Paria, but there were more cows than I recall. Saw the longhorns again which gave me a fright back in 2006. After passing Deer Creek, I went up Snake Canyon with more bushwhacking at the bottom. 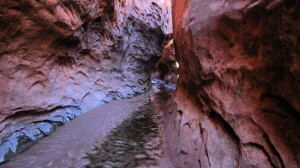 I went straight up the creek most of the way admiring the towering red walls on each side of the canyon. After hiking an hour up the canyon I got to a 25′ waterfall that I couldn’t get past. I knew this was here, but guides indicate that it would be doable with a short rope via a scary route which climbed up the side. But, it looked too sketchy for me. I wasn’t willing to risk it being solo with a big pack. So…back to the Paria. New plan — Hogeye Canyon tomorrow. There was a meteor shower this night, however I was dissapointed to see only two shooting stars. Not sure if the event was a dud, or if I was too tired to keep my eyes open (and focused) very long! Made my way up Hogeye Canyon. I did this canyon back in 2009, so I pretty much knew exactly what to expect. Made my way past the cascades which were not flowing as strong this year. Then I made pretty quick work of the rock fall. Loaded up on good water before a long sandy stretch. The water returned farther up canyon, but cows can get here so it was pretty mucked up. Used the slickrock exit near the northern end of the canyon. I was surprised to see one medium sized pothole of water up here. From here it was a real calf burner right up the slickrock and out of the canyon. 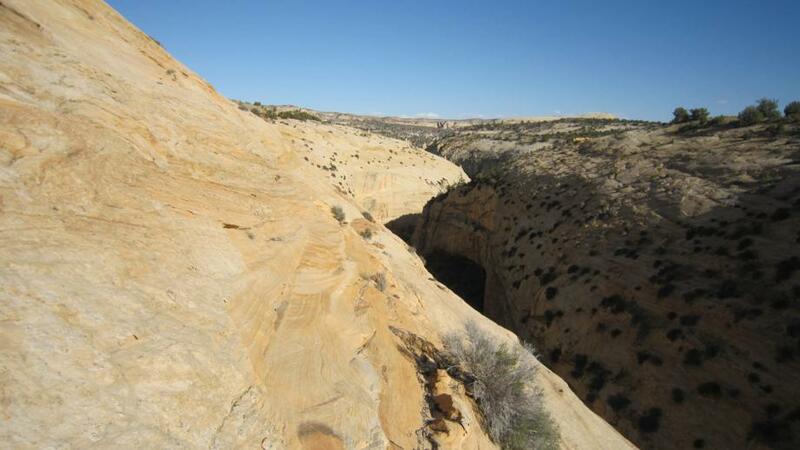 Up on top, I made my way across sandy rolling hills to Upper Stone Donkey Canyon. It was extremely hot crossing the open areas. Spotted a big rattlesnake in this area in 2009, so I was on the lookout again, but nothing but cow pies this time. Once I entered the Stone Donkey drainage the scenary picked up. Cool white sand dunes and awesome slickrock formations. 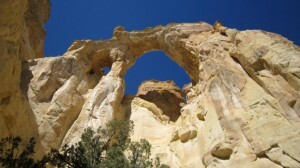 Spotted a small arch which I named Howling Wolf Arch. 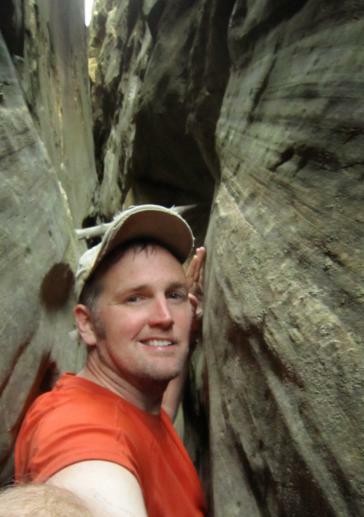 Once past the upper end of the canyon, I had to do a scary slickrock traverse to get past the rappelling section. The path seemed to get more and more narrow and more and more steep the farther I went. The whole time there is a 400′ drop looming just off the side. As a day hiker this would probably be no big deal, but with the big pack my legs got a little wobbly as I was more aware of each step I took. Once past the slickrock, a break in the canyon’s north wall allows one to get down. It’s still rough terrain and took a while to find the way down into the canyon, but I finally made it down. Once down I dropped my pack and went to explore the slot. It was very tight and dark. I had to get into thigh deep cold water. I turned around when it got too dark to see. Camped at lower end of canyon near the spring. Made my way out of Donkey Canyon and then down a nice stretch of Hackberry Canyon. There was a lot more cow mess here than I remember in 2009. I was looking for the Goulding Trail, but somehow I missed it and ended up at the rockfall down canyon, so I had to backtrack 20 min. Saw a dead cow near the route. Once I began to climb I was astonished that this old cowboy trail was still in decent shape. Once up on top of the canyon I lost the trail. But, my intent was to head east on my own route anyway so I headed across the Rush Beds. Climbing up and over the uplift of rocks was no easy task — but it was very scenic with many “wave” like formations and great views of Cottonwood Valley. It was tough going, but exciting to find my own route. Water was running in Cottonwood, but it was also tainted by cows. I filter all water but it still tastes terrible. Now I love me a hamburger, but there has got to be a better way. Raising cattle here ruins the environment and doesn’t seem to make for healthy cows either! I road walked a while on Cottonwood Road. I saw the 1st person that I’d seen in 3 days driving along the road. I camped south of Cottonwood Narrows. Beef stroganoff for dinner paired with beef tainted water! I left Cottonwood dirt road at south end of the Narrows and went up the canyon from there. 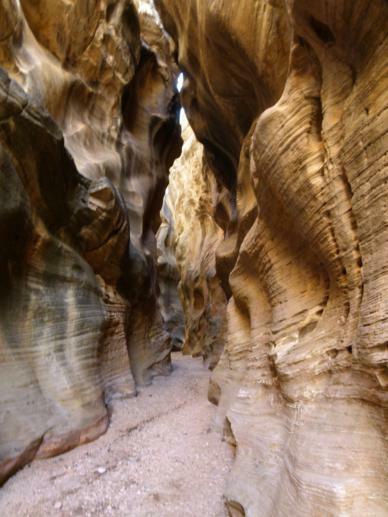 It was nice to get off the road for a while and back into the cool confines of a narrow canyon. The northern end is the best and really the only portion which can be considered really a “narrows”. Back on the road, I was on the scenic red/white “Candyland” portion of the road. A little farther up I met a friendly couple from France on their bikes. 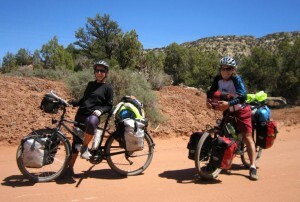 They are pedalling across the western US. Later I got to a well and the water was awesome; cold and clear! I dumped all my cow water and endulged in the good stuff — even had a bag of granola. Then, I filled up for the long dry stretch ahead as it is still fairly warm by day. I stopped briefly at Grosvenor Arch then headed to the east across the plateau. Once past “the gut” I headed up Wahweep Wash. There were some pools of muddy water along the way. I camped up near Headquarters Springs. The water direclty from the spring’s pool was was not that good, however there was a dripping spring a few bends north which was MUCH better. I’m still about a day behind. I hope to make up time soon. A crescent moon sets as I write. Continued up Wahweap Wash. 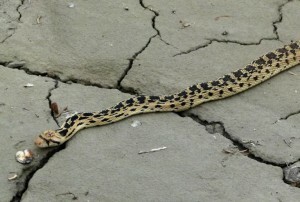 Saw my 1st snake of the trip — it was a Great Basin Gopher Snake. Climbed out of the wash and headed along the ridge to get better views. I followed mud hill ridges for a ways –awesome. Then during a rest, I heard voices. I thought I may be crazy at first as this is one of the most remote spots in the United States. I finally spotted two guys on a far cliff. They were too far to see clearly so I zoomed in on them with my camera. They were digging — maybe for dinosaur fossils which are occaisonally found in this area. Then it hit me; what if they were illegal dino poachers and somehow they spot me filming them! I got out of there as quickly as possible now with a (probably) irrational sense of paranoia. I continued my grueling climb to the ridge and then I dropped into Collet Canyon. I had no beta on this canyon so it was exciting to see if it would go through. It was a bit of a scramble and I had to jump down dozens of boulders, but there was always a way. Camped, for the night, a mile plus from Smoky Mountain Road. Tagged Asay Slot, Bryce Canyon, Collet Canyon, Cottonwood Road, Dixie National Forest, Escalante, Grosvenor Arch, GSENM, Hackberry Canyon, Hogeye Canyon, Kaiparowitz Plateau, Paria, Rush Beds, Sheep Creek, Slot Canyon, Snake Creek, Stone Donkey Canyon, Upper Paria, Utah, Wahweep Wash, Willis Creek. I sure like that arch which looks like a wolf howling at the moon. You gave it the perfect name! Cleaning the house and your adventure came to mind! Hoping for good weather, good water and no wild dino banditos for you! Thanks for following along, Janelle. Enjoy reading your daily post. Hope you continue to find well water. Drink up and hoping for more good wells on your trek. Cheers and continued happy hiking! 30 horses, that Would be different. hope all is well. we are following your progress. be safe.